Here I am again! Aqui estou eu de novo! Almost every Saturday morning I dedicate a hour (or more) to cross stitch, my parents aren’t here (usually not in the afternoon either but we never know). Now that I began my internship (this week) I’ve some free time in the morning so I’m usually cross-stitching too. Quase todas as manhãs de Sábado dedico uma hora (ou mais) para ponto de cruz, os meus pais não ‘tão cá (habitualmente também não estão à tarde mas nunca se sabe). Agora que comecei o meu estágio (esta semana) tenho algum tempo livre de manhã e aproveito para fazer ponto de cruz. But what am I cross stitching? A couple in their wedding day. In August (or December, they’ve two wedding dates) they’ll be celebrating 20 years since their wedding, so I thought it was nice to make something. Mas o que estou a fazer? Um casal no seu dia de casamento. Em Agosto (ou em Dezembro, eles têm duas datas de casamento) eles irão celebrar 20 anos desde o seu casamento, achei que seria simpático fazer algo. Have a nice week! Boa semana! P.S.-> I’ve to post pictures of my gloves that are almost done! P.S.-> Tenho de postar fotografias das minhas luvas que estão quase prontas! 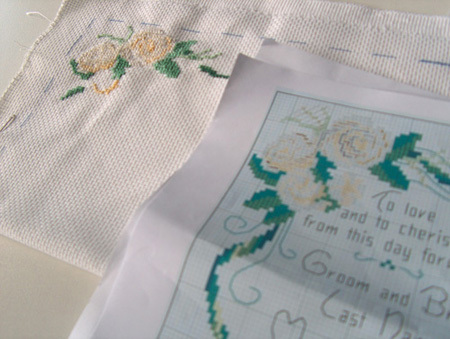 Your cross-stitch is beautiful! I am not patient enough to do that at all! But I understand what you mean about enjoying watching it grow! I love to crochet with thread and see the pictures from the pattern form as I go. And you are right that if you are weaving in ends as you go, it will take a bit longer but it is worth it so you don’t have so many at the end! 🙂 I can’t wait to see your gloves! What a lovely and heartfelt gift! I love the idea of spending an hour a day doing that. It sounds like the best kind of meditation.